A real-time searchable database of all the terms you need to know as a modern marketer. This is a sum of revenue generated / number of orders taken. It a very useful metric when understanding how much you can afford to spend on acquiring customers. Simply a process or set of rules to be followed in calculations or other problem-solving operations run by a program or application. They can be summed up and simplified to being math equations. For example, Google's search-ranking algorithm takes hundreds(or thousands) of factors into account to determine who ranks where, for what term. The percentage of viewers to a particular website who navigates away from your page after viewing only one page. The art & science of studying data, hypothesizing tests, and executing A/B or multivariate tests in order to obtain a higher percentage of conversions. Software that handles company's interactions with current and future customers. It often involves using technology to organize, automate, and synchronize sales, marketing, customer service, and technical support. Some of the CRM's that SendGrowth recommends are HubSpot, Intercom, Streak, Salesforce. The corporate executive responsible for marketing activities in an organization. Most often the position reports to the chief executive officer or the chief brand officer. This is a dollar amount that describes the amount of money it took to convince a potential customer. It includes the product cost as the cost involved in research, marketing, and accessibility costs as well. A metric that is used a lot with affiliate marketing. Derived from Profit ÷ Clicks × 100 (typically). It's a number that helps attract additional affiliates, because if this number is high then that means there a high conversion rate for targeted traffic. A marketing technique developed by technology startups which mixes creativity, analytical thinking, and social metrics to sell products and gain exposure. A lot of people consider this to be modern day marketing. 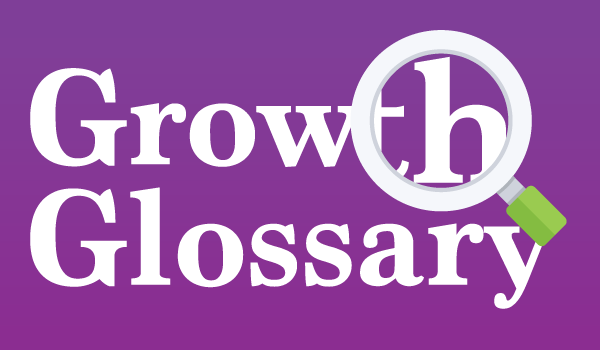 A term people use to describe a person who partakes in Growth Hacking. Some activities such as traffic generation, content writing, analytical research, A/B testing, email marketing, and much more. The act of bringing people to a destination, online. This can be done in a variety of ways, like content marketing & advertising. A popular term when speaking in terms of SEO (search engine optimization), the act of getting people to link to your website, using certain anchor words. This helps Google identify the best sites, in order to optimize their algorithm. A business or software distribution model in which applications are hosted by a business and made available to customers over the internet. Revenue models are typically done subscription based per month, quarter, year, or other. The process of attempting to rank higher for certain keywords on search engines. This is done by a variety of ways, and it's a competitive by nature activity. Google has a lot of resources on how to follow their guidelines when it comes to ranking, you can see a great summary here. Marketing term used for cookie-tracking based technology. Many ad networks like Facebook, Twitter, YouTube, (and many more) utilize this technology. Once a visitor has seen a certain page, containing a retargeting pixel, their browser stores minimal information with them. Marketers then use this process to advertise to those individuals who have certain cookies installed. It makes optimizing certain aspects of your website or campaigns very easy. The script that networks use to capture & store information on your behalf. An invisible pixel is sometimes used as the tracking method, which is where the terminology came from. A modern day website, custom built for a businesses needs. Accessible through popular web browsers on any device.